The trip to Japan is almost over and it’s time for a first recap. Let’s start with a first round-up post of my side-trip to Osaka. Last tuesday I took the bullet train (Shinkansen) from Tokyo main station to Shin-Osaka. Traveling across Japan using the Shinkansen is quite relaxed and convenient for foreigners and I was amazed that most of the Japan Rail staff speaks decent english. After just about three hours I arrived in Osaka and already one hour later I was on the way to Biwako together with Masami Motoki of Tsunami Lures. 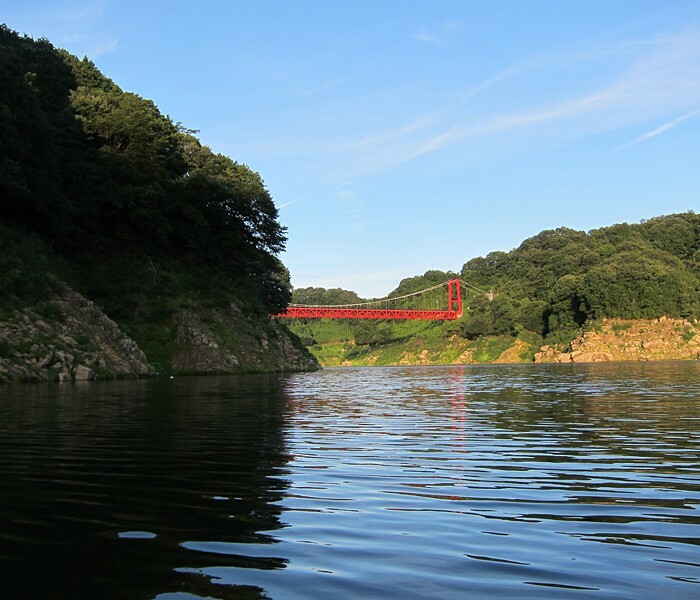 We used the one-houre ride for lively talk about Japan’s Topwater scene and it’s popularity across the world. 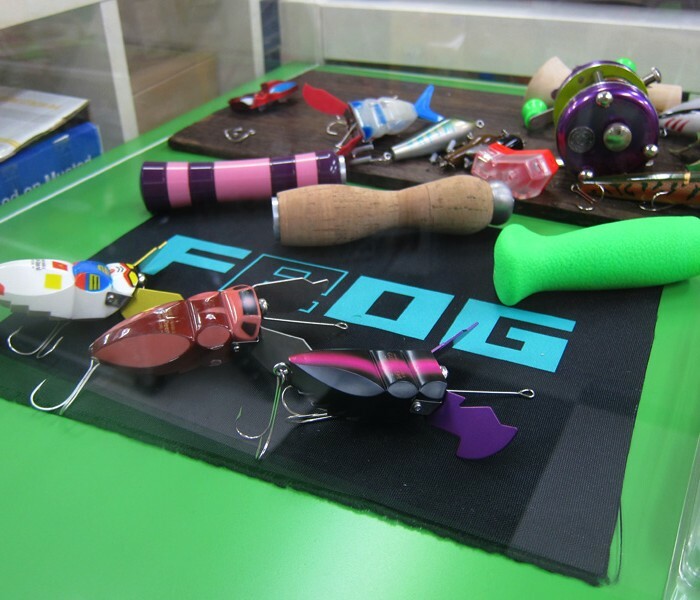 It was really interesting to get more insights into the vibrant microcosm of Tsunami Lure’s handmade lures and custom tackle while learning more about the cultural context of Topwater Bass Fishing. Arriving at Biwako in the afternoon was a stunning experience. I already saw a lot of videos and pictures from the lake, but it was really impressive to see how huge this water really is. Fishing the lake was quite special. We started exploring the dense and thick weed beds Biwako is well known for and after just a few minutes I had a first strike on a Kaeru weedless frog. 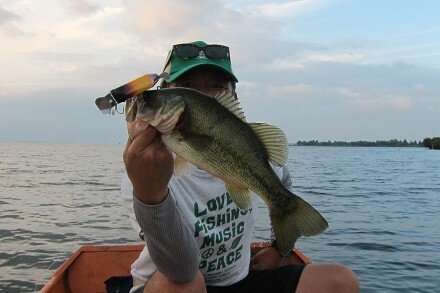 Between sunset and nightfall we had a few more strikes and Motoki-san caught a sweet bass on a noisy plug. In almost complete darkness we continued fishing the banks and nearby weed beds. 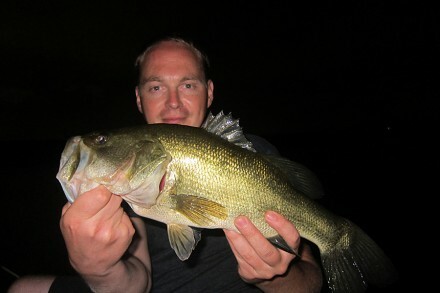 Within the next 3-4 hours we had around seven bass and a crazy Blu Gill (see photos). Lure of choice for the time after nightfall was a Slapphappy Shad Grande Prop Color: Aztec Fish Fluorescent Pink(AF-FP). This bulky noisy plug was the perfect choice for luring bass out of cover and slow retrieve and short stops worked out perfectly. 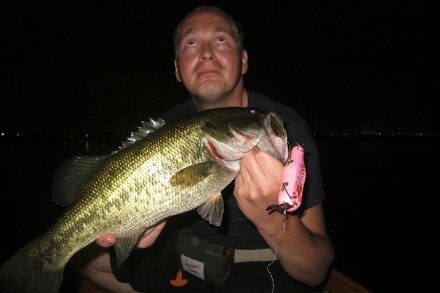 Topwater bass fishing at Biwako is quite special. 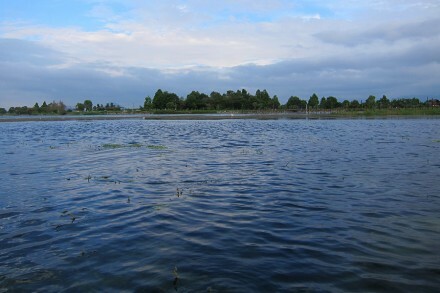 You can experience stunning topwater strikes and even from mid-sized bass around 45cm you can expect strong fights. We stayed at Biwako until 11pm and completed this perfect and highly exciting night with delicious Ramen and Gyoza at a nearby restaurant. Thanks again to Masami Motoki of Tsunami Lures, Osaka.